Summer fun at its best! Attention to detail for your comfort. Welcome! Kick your shoes off and relax. Lovely and comfortable Living Room with slider to patio and pool. 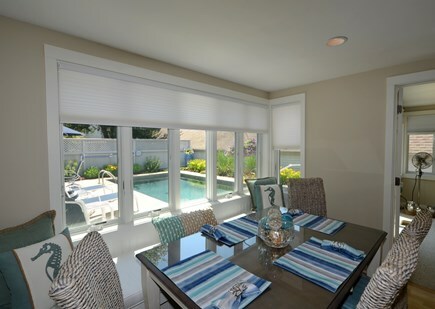 Dining area with built-in bench and pool view. 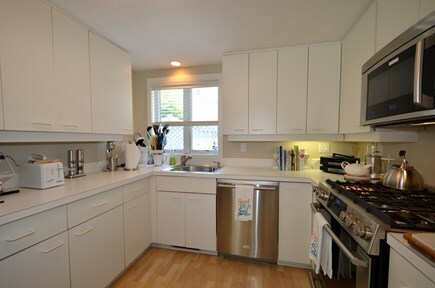 Well appointed kitchen with stainless steel appliances. First Floor bathroom with walk-in shower. First floor Master Bedroom with slider to pool and patio. 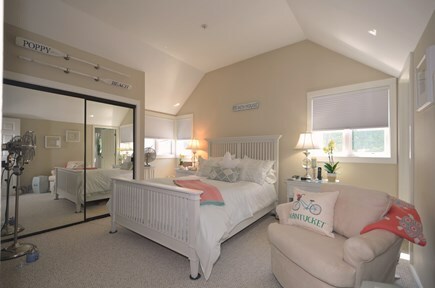 Upper level Master Bedroom with private full bath. 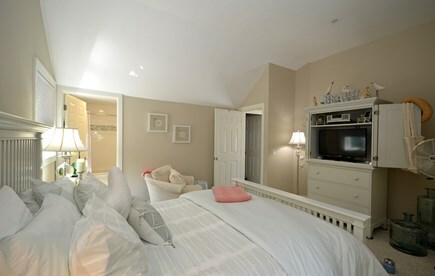 Another view of the upper level Master Bedroom. 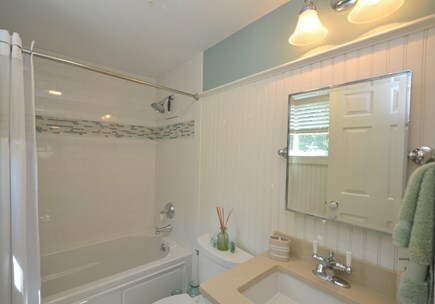 Upper level Master full bath. 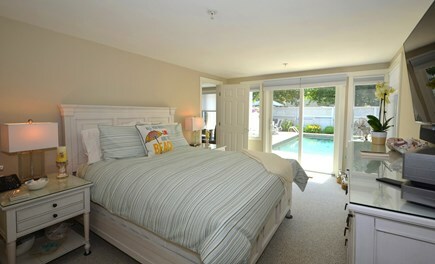 Upper level Twin Bedroom with full private bath and view of pool. Upper level guest private bathroom. Private pool and patio area with gas grill. Refreshing pool and patio for lounging. BBQ grille as well. 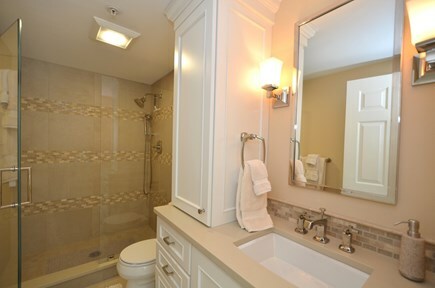 This lovely condo has recently been refurbished both inside and out. It includes TVs, DVD players, and BOSE Wave radios in each of the bedrooms and kitchen as well as a BOSE Home Entertainment System in the living room with BOSE speakers and a WII U, an xBox I, and a Sony PS4 set up for lots of fun and challenges. We also have a. 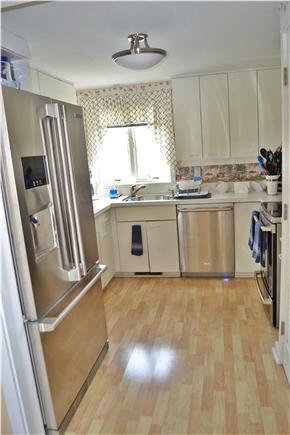 The kitchen has new Electrolux stove, dishwasher, microwave, and refrig. There is a private in-ground pool with brand new poolside furniture and a BBQ for those who enjoy cooking at the poolside during the warm evenings. The first floor features a living room, kitchen, dining room, and master bedroom with queen bed and full bath. The living room and bedroom overlook the pool area, and living room has WII set up. Upstairs there are two bedrooms, one with a queen bed and full bath and the other with twin beds and a full bath. 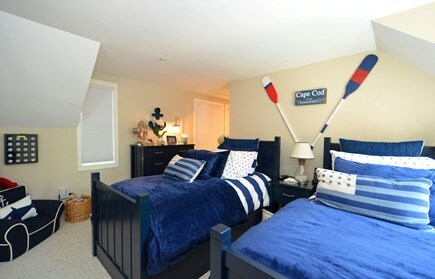 The twins bedroom overlooks the pool. 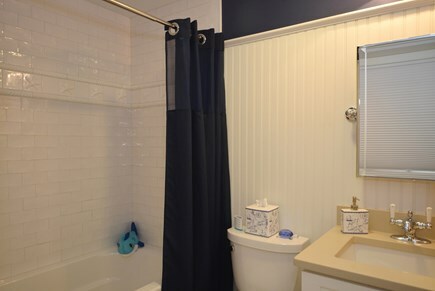 Spoil yourself by taking hot shower, or even better, a bath and use the many plush spa-like towels that come provided in each of the bathrooms....New for 2011 three Samsung LED TV's, all with Internet access on the screen. L/rm has a 55'' series 8D with 3D/glasses. The master has 55'' series 8 3D/glasses. The guest room has series 7 LED 32'', and the kids rm has a new 32'' as well, The best that's out there now! Adults and children will enjoy movies played on the Home BOSE Theater System. Free phone service for all calls within the US and wireless internet. There is an ADT Home Security System for your use, too. Enjoy the many shops and restaurants in the nearby village, and don't forget the ocean 1 mile down the street. There is a $200 cleaning fee per/wk and a $1000. security deposit. Additional availability info: Pool is not available in May. This is a Saturday to Saturday vacation rental. Additional pricing info: Off-season weekends: $225-300 with a 3-night minimum; $200 cleaning fee, State and local taxes of 12.45% will apply. 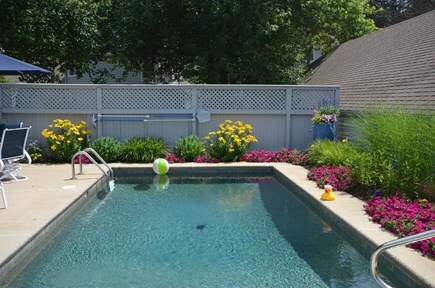 This pool villa at New Seabury was so perfect for our week on the Cape! Louise and David have provided EVERYTHING you could possibly need for a relaxing wonderful week away. Their personal touch is throughout the villa...impeccably clean, and the private pool was amazing! We will be back again this summer! Thanks, David and Louise, for another perfect week at your beautiful condo. We especially appreciate your attention to detail and the thoughtful things you do for your guests. Our son loved your decadent brownies. We can’t wait to visit again in 2019! Wishing you all the best in 2019. Amazing Summer Vacation Get Away!!!!! My family and I have enjoyed this beautiful home for the past 5 summers and we cannot imagine going any place else. We find it to be the perfect place to enjoy quality family time, relax and have fun. It is officially our summer vacation tradition! Even better are the owners who are so very kind and thoughtful...always adding a personalized touch to make our visit special and going out of their way to ensure we are comfortable. We love your pool villa. Your attention to detail for everything you provide for your guests is amazing. The new bathrooms are luxurious. Your sheets and towels are from a 5 star hotel! 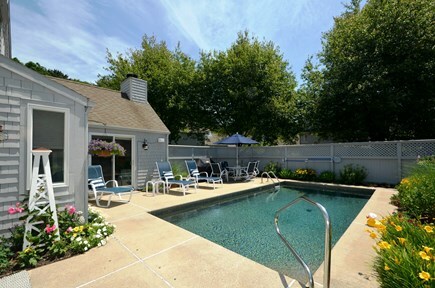 You are very caring owners and provide a clean and meticulous rental with a gorgeous pool. We cannot wait to return! We have rented this beautiful vacation home for six consecutive years. It is our summer home away from home and we have made many happy memories there. The villa is comfortable, well appointed and beautifully decorated. The owners are the perfect hosts and they take great care to provide everything you will need.The pool is an amazing place to relax. Thanks, David and Louise, for sharing your little piece of Cape heaven with us. 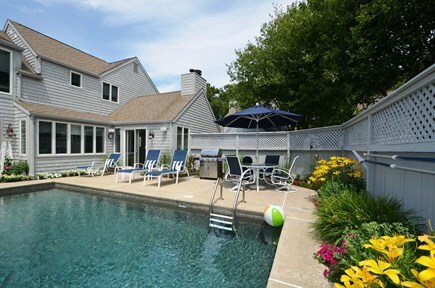 New Seabury with Private Heated Pool! 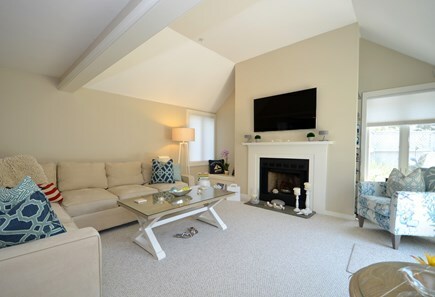 New Seabury fantastic vacation condo home! It was so sparkling clean and updated! We, along with our 2 grandchildren (ages 4 and 6) loved every minute! We especially appreciated our private heated pool! Felt like being at our own resort! Our hosts buy new sheets, towels, and comforters each year! We spread out on both floors and the 3 large bedrooms and 2 baths were perfect! There was even a washer and dryer as well as 4 TVs! Fabulous location! Private yet It was close to MarketPlace restaurants, miniature golf and even early evening live entertainment and dancing for the little ones!, We drove about 5 minutes to South Beach for wave jumping and castle building! We loved shopping at nearby Mashpee Commons! Thank you for another amazing week filled with beautiful memories. We couldn't ask for anything more. Untill next year,we wish you good health and happiness. Thank you again for another wonderful vacation at your home. We enjoyed great weather and perfect surroundings,your villa is so welcoming we hated to leave ! !Best wishes for a healthy year ahead and we'll be back next year. Visiting from England we had a truly awe some week.This is a beautiful villa,we loved staying here and used the pool every day. Thanks Louise and David for being so welcoming and looking after us.We loved our week here and could'nt of had a better time. We had a great time as usual ! 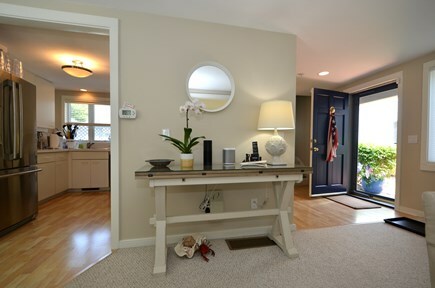 Your home is beautiful and relaxing.We tried to leave the house as spotless as we found it! I'm gonna need a lesson from Louise on how to roll the pool towels so perfectly. we hope you have a happy relaxing birthday ! David hang in there pal,continue to fight the good fight !!! We're always thinking of you.